From the early 19th century to the present day, women have played crucial roles in the development of technology, however they are systematically underrepresented – and underpaid – in STEM industries today. Part of the problem is that female pioneers of computing, programming, mathematics, and science have largely been written out of history by the technology industry, meaning their stories have at best been forgotten, and at worst, intentionally erased. Many will be surprised to discover, for example, that computing was traditionally regarded as a feminized role, with women making up the largest trained technical workforce in the computing industry from the Second World War to the 1970s. Women were seen as the ideal ‘drone’ worker to operate computers, and as they were expected to leave work to start a family at a young age, managers didn’t feel obligated to offer them any career prospects. It was women who operated the monolithic, room-sized early computers used to calculate ballistics and crack enemy codes during the war, and when computers made their way into the workplace it was women who worked behind the scenes to ensure governments were able to collect data. It was a woman who sent the first manned US spaceflight into orbit. Despite the early success of these early innovators, as male managers began to realize the importance of computers in the 1970s, women were pushed out of the industry, and their roles were given to men for higher pay. Women weren't trusted with the very technical work they had pioneered. The whitewashing of women’s role in the early tech industry means bias still exists today, on a huge scale. Google has been accused of underpaying women systematically, and in the US just 10% of women held the highest-ranking jobs in the industry as of April this year. Who knows what this percentage would be if the female computing workforce hadn't been written out of history. Widely regarded as the world’s first computer programmer, Augusta Ada King-Noel, Countess of Lovelace was a 19th century mathematician and writer. Born in 1815 in London, she was the only legitimate child of Romantic poet Lord Byron and his wife Lady Wentworth, and was encouraged by her mother in particular to pursue her interest in mathematics. As a teenager, she befriended Charles Babbage (who's sometimes known as ‘the father of computers’), and began work on his proposed general purpose computer, the ‘analytical Engine’. During this work she hypothesized applications for the computer beyond pure number-crunching, and published the very first example of an algorithm to be used by a machine. She even predicted the use of computers to compose music. Although some (mostly male) biographers and historians have refuted the extent of Lovelace’s contribution to computing, her work paved the way for Alan Turing work’s on the first modern computers during World War II. Sadly, she died young at 36 due to uterine cancer. A rare first edition of her pioneering algorithm was sold last month for nearly £100,000. Morgan Mercer is the founder of Vantage Point, and she created a virtual reality demonstration on sexual harassment. Her goal was to address the problem of sexual harassment in the workplace, which Stop Street Harassment reported 38% of women and 13% of men have experienced. As a two-time survivor of sexual violence, Mercer was all too aware of how difficult it can be to talk about. Her pioneering technology immerses the user in a virtual workplace, where they become witness to sexual harassment taking place and can learn about how to tackle these situations in a professional and empathetic manner. Compared to traditional training methods, which have a knowledge retention rate of 20%, immersive training boasts a rate of 90%. However, Mercer is always looking for ways to improve the technology, and she's particularly interested in adding interactive speech so users can speak in the virtual world, as well as training in how to report harassment. NASA in the 1950s was dominated by white men, but some talented women were able to rise through the ranks thanks to their hard work and challenging of the status quo. Perhaps the best-known of these pioneering women is Katherine Johnson, whose calculations played a crucial role in the first US manned space flight. Born in 1918 in West Virginia, Johnson showed an aptitude for mathematics from an early age and was admitted to high school aged just 10. At the time her county didn't provide public education for African American children beyond the eighth grade, so her parents enrolled her in high school in Institute, Virginia, from which she graduated at 14. She proved herself to be a formidable mathematician at West Virginia State University, graduating with degrees in mathematics and French. Although she began her career in teaching, her dream was to be a research mathematician, and she accepted a job with NASA's predecessor organization, the National Advisory Committee for Aeronautics in its Guidance and Navigation Department. 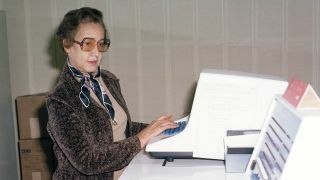 Johnson became joined a pool of women who were essentially working as human computers, or as she described it, “computers with skirts”. Although the department was mixed, in accordance with state racial segregation laws, Johnson and the other African-American employees were forced to work, eat, and use the restroom separately to their white colleagues. Despite the racial and gender bias she and her co-workers experienced, her talent for calculating projectories, launch windows, and emergency return paths for spacecrafts saw her become one of the most highly regarded people in her field – so much so that when digital computers were used for the first time by NASA to calculate John Glenn's orbit around Earth, he refused to fly until Johnson had verified the calculations. Johnson worked at NASA until her retirement in 1986, and in 2015 the then 96-year-old was awarded the Presidential Medal Of Freedom by Barack Obama. The achievements of Johnson and the other women of the computing pool were celebrated in the 2016 movie Hidden Figures. Kim Swift is a renowned games designer, best known for her work at video game developer and distributor Valve. While there, she designed Portal, the immensely popular first-person puzzle-platform game, which has won multiple awards for its innovative gameplay and design. Swift also designed Left 4 Dead, another Valve bestseller. Female game designers have typically had a difficult time in the industry, particularly with the Gamergate controversy, which saw notable figures like Brianna Wu and Zoe Quinn subjected to torrents of sexist abuse at the hands of internet trolls. As a result of Gamergate, the video game and wider technology industries are making steps to create a supportive environment for women, trans, and non-gender binary professionals; however there's still a long way to go before the gaming world stamps out discrimination entirely. Grace Hopper was a computer scientist and rear admiral in the US Navy. Born in 1906 in New York, she graduated from Yale with a Bachelor’s Degree, Masters, and PHD in Mathematics before becoming a professor at Vassar College. During the early stages of World War II, Hopper attempted to enlist in the Navy but was unsuccessful due to her age (at 34 she was considered too old), and because her work at Vassar was considered too important for the war effort. Nevertheless, she requested a leave of absence from the college and entered the US Naval Reserve. She was assigned to the Bureau of Ships Computation Project at Harvard University as a Lieutenant, where she worked on the Mark I electromechanical computer. While there, Hopper popularized the idea of machine-independent programming languages, and invented the compiler, which converts code written in one programming language into another. This led to the invention of COBOL, an early high-level programming language based in English that's used to this day in Windows, OpenVMS, and Unix. Hopper continued to rise up the ranks of the US Navy before being made commodore and then rear admiral by special Presidential appointment. After a 42-year career with the Navy she retired in 1986 and was awarded the Defense Distinguished Service Medal. Known affectionately as ‘Amazing Grace’ and ‘Grandma COBOL’, Hopper died in 1992 at the age of 85. To most people, Facebook is synonymous with its creator Mark Zuckerburg, however you may not know that much about its chief operating officer Sheryl Sandberg. Sandberg was born in 1969 in Washington D.C. In 1991 she graduated from Harvard College with a bachelor’s degree in economics, and went on to Harvard Business School, where she earned her MBA with the highest possible distinction. After working for United States Treasury Secretary Larry Summers, Sandberg joined the then emerging startup Google as its first business unit general manager, playing a key role in setting it on the path to becoming 100 billion dollar-plus company it is today. In 2008 Sandberg joined Facebook as chief operating officer, becoming the first woman to sit on the board of the social media giant. She quickly identified that advertising could turn Facebook from ‘a really cool site’ into a profitable company, and by 2010 she achieved that goal. She currently oversees all of Facebook’s business operations, including sales, marketing, human resources, business development, public policy, and communications. As well as her work at Facebook, Sandberg is the founder of LeanIn.Org, a non-profit organization that aims to ‘empower women to achieve their ambitions’. Based on her bestselling book ‘Lean In’, 380,000 women and men have joined the Lean In community, which has been behind campaigns to stop assertive women and girls being called bossy, and to close the gender pay gap. Born in 1915, Hedwig Eva Maria Kiesler was an Austrian actress – you'll more likely know her as Hollywood star Hedy Lamarr, but what you may not know is that she was also a prolific inventor. Having been discovered in the 1920s by producer Max Reinhart, she shot to stardom in Europe in films including No Money Needed and Gustav Machaty’s Ecstasy. In the late 1930s she moved to Hollywood and changed her name to Lamarr to distance herself from her earlier career and was signed by MGM studios as a leading lady, appearing alongside the likes of Clarke Gable, Judy Garland and Lana Turner. Away from acting, Lamarr had another passion: inventing. Although she had no formal training, she was often tinkering away at her creations, including an improved traffic light system and a tablet that dissolved in water to make a fizzy drink. Few knew about her proclivity for invention, aside from aviation tycoon Howard Hughes, who essentially gifted her his team of engineers. Her most important invention came during World War II, when she realized that radio-controlled torpedoes could be knocked off course. Her solution was to invent and patent a frequency-hopping signal that was impossible to hack. Although the US Navy didn’t adopt her technology until the time of the Cuban Missile Crisis in 1962, Lamarr's work was incorporated into early versions of Wi-Fi and today's Bluetooth technology. You’d be hard-pressed to find anyone (in the UK at least) who isn’t familiar with the frightening white noise of the Doctor Who theme tune, but until 2013 the woman behind the music, Delia Derbyshire, remained uncredited on screen. Born in Coventry in 1937, she joined the BBC as a trainee studio assistant manager in 1960 after a failed application to Decca Records, who told her they didn't allow women to work in their studios. Two years later she was assigned to the now-legendary BBC Radiophonic Workshop, where she electronically realized composer Ron Grainer’s Doctor Who theme tune, creating what would become her most recognizable piece of work. Using musique concrète techniques and test-tone oscillators, she painstakingly trimmed analogue tape for each note and stuck it back together to form a melody or line. Although her efforts went unrecognized for a number of years, she has since been referred to as the ‘unsung heroine of British electronic music’, paving the way for the use of tape manipulation and sampling in early hip-hop. In 1975 she stopped producing music commercially, although her long-term partner Clive Blackburn noted that she never stopped writing music privately. Valentina Tereshkova was the first woman to fly in space, as well as the first civilian. She was born in 1937 in central Russia, and became interested in parachuting from a young age, taking skydiving lessons while working at a textile factory. In 1961 she became secretary of the Young Communist League, and later joined the Soviet Communist Party. Following the first space flight by Yuri Gagarin in the same year, the Soviet space program became interested in sending a woman to space. In 1962, Tereshkova was selected along with four other women to join the female cosmonaut corps, and carried out training including weightless flights, parachute jumping, pilot training, and spacecraft engineering. Her first and only space flight was in 1963, when she piloted the Vostok 6 spacecraft. She spent nearly three days in space, orbiting the Earth 48 times while maintaining the flight log and taking important photographs of the Earth’s atmosphere. Her pioneering flight made space travel possible for female cosmonauts and astronauts who followed in her footsteps, proving that women were capable of coping with the physical and mental demands of space flight. After her historic flight she studied to be a cosmonaut engineer, and in 1977 she earned a doctorate in engineering. Alongside her career in the Russian air force, she held several prominent political positions within the Soviet government. Anne Marie Imafidon is the founder of Stemettes, a social media enterprise promoting women in STEM (science, technology, engineering and mathematics) careers. Born in the UK in 1990, Imafidon was a child prodigy in computing, mathematics, and language, and became the youngest-ever graduate with a master’s degree at the age of 19. Since then, she has received honorary doctorates from Open University & Glasgow Caledonian University, and an honorary fellowship from Keble College, Oxford. Since its inception Stemettes has worked with almost 40,000 young people across Europe, helping Imafidon to pursue her dream of a more inclusive and diverse STEM industry. In the UK, women make up just 24% of those working in core STEM industries according to WISE, however this does represent a significant increase in recent years, demonstrating that positive change is happening thanks to initiatives like Stemettes.